If you've hung around gym bros as much as I have, then you're pretty familiar with eating disorders - especially bulimia. Seeing large dudes with even larger appetites pound a bunch of fast food and then force themselves to throw it up isn't a pretty sight, but it's a common one. And although many don't picture overly muscular men as the poster children for eating disorders, a lot of times they are. Another specific demographic of people who've developed eating disorders that aren't often discussed at diabulimics: people with diabetes who restrict their insulin intakes in order to manage their weight. And if you know anything about diabetes and how important insulin injections are to maintaining to a diabetic's survival, then you can imagine how disastrous diabulimia can be. Natalie Holborow suffered from this condition. In a candid Facebook post, Holborow talks about how she would restrict her insulin in the past in order to stay thin, and made a call to bring awareness to the condition, hoping that medical professionals will recognize it as a problem that needs to be seriously addressed. This is a difficult one to post but one I feel is important because "diabulimia" is STILL not recognised as an official medical term in Type 1 diabetics and this desperately needs to change. Insulin restriction, or diabulimia, is an eating disorder which affects as many as 1 in 3 diabetic females (obviously males can suffer too but the vast majority are females). On the left, I was22 years old, severely underweight and in outpatients treatment. I wasterribly affected by the bullying I went through in school and lost a massive amount of weight by skipping not only meals but cutting back on insulin, something which is life-threatening as a Type 1 diabetic. I was so far into my illness it was impossible for me to think rationally. I was blue with cold a lot of the time, losing my hair, hormones didn't work and you can see in my eyes how sad and consumed by it I was. Fast-forward three years and I've switched to insulin pump treatment, take insulin with EVERY meal, have now got a perfect blood sugar average and have reversed the damage caused (my retinopathy has reversed completely) as well as kept my weight at a healthy level for over a year. Ican run half marathons now, and last week had the strength and energy to complete Tough Mudder Half, something I never thought I would do. Other sufferers aren't so lucky. 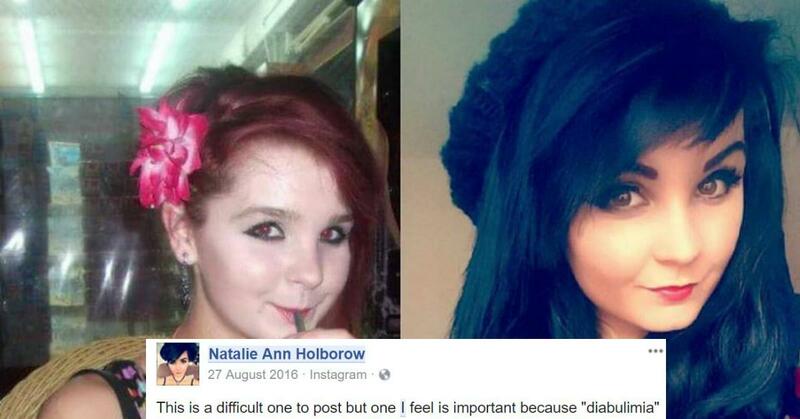 This post is simply to show how far I've come, to tell people it's OKAY to speak out about it (and believe me I'm terrified sharing this) and that health professionals really need to keep an eye on patients to recognise that what they often deem to be "rebellion against diabetes" could in fact be an eating disorder. You can clearly see the difference in weight in the two pics but the biggest difference? My smile. I'm fully living life now. Diabetes is not just physical, and more needs to be done to support people mentally. I've had that support from my mum and my amazing partner Matt as well as a fantastic psychologist, but the health service needs to wake up to the fact that with diabetes being so focused on food and control, more support is needed not to make patients feel guilty for bad blood sugar levels but to realise it may be a cry for help. Holborow has a point, research indicates that around 40 percent of Type 1 diabetic women have manipulated their insulin intake in order to manipulate their body weight. Lisa Day is one example, who had become severely underweight and was diagnosed as anorexic. The problem is, doctors tried to address her disorder by addressing her issues with eating and not addressing the real problem: her insulin intake. After restricting her insulin intake for so long, Day had developed kidney problems and an eye disease. She had eventually corrected her insulin intake but at that point it was too late. She died in September of 2015. Jacquelin Allen, founder of Diabetics with Eating Disorders said in an interview with Indy100 that oftentimes diabetics who are placed in eating disorder wards are oftentimes not given access to insulin - which is usually the one thing they need to correct their behavior and ultimately save them from permanent damage to their bodies. Although diabulimia is a bigger problem than many realize and there have already been a number of tragedies associated with the condition, there is some hope. Coverage of diabulimia is becoming more widespread in the media, like this BBC documentary about the condition that was just released.